Designed with nutritional ingredients that help support comprehensive health and boost immune system function. 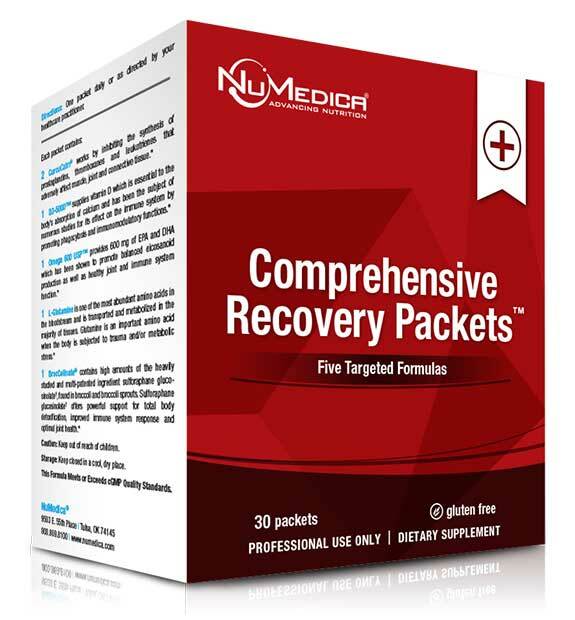 NuMedica Comprehensive Recovery Packets are ideal for overall health by supporting skin tissue, joints, the digestive tract, and just about every organ in your body. This advanced nutritional supplement is a combination of five nutritional formulas contained in one convenient daily-dose packet. Each packet is designed to provide the nutritional support your body needs to protect your muscles, joints, organs, and connective tissue. NuMedica CurcuCalm is designed to reduce the inflammation associated with chronic inflammatory conditions like osteoarthritis and rheumatoid arthritis. CurcuCalm works by inhibiting the synthesis of prostaglandins, thromboxanes and leukotrienes that adversely affect muscle, joint and connective tissue. NuMedica D3-5000 Bio-Identical Vitamin D is a natural, soy-free, bioidentical vitamin D supplement that supports overall bone health and the immune system. D3-5000 supplies vitamin D which is essential to the body's absorption of calcium and has been the subject of numerous studies for its effect on the immune system by promoting phagocytosis and immunomodulatory functions. NuMedica Omega 600 USP EC provides Omega-3 essential fatty acids for a stronger heart as well as improved brain function in a lipid concentrate form for maximum convenience. The 600 mg EPA and DHA has been shown to promote balanced eicosanoid production as well as healthy joint and immune system function. NuMedica L-Glutamine supports the immune system, enhances digestive system health, and improves nutrient and water absorption. L-Glutamine is one of the most abundant amino acids in the bloodstream and is transported and metabolized in the majority of tissues. Glutamine is an important amino acid when the body is subjected to trauma and/or metabolic stress. NuMedica BrocColinate Extra Strength is an antioxidant-rich supplement that enhances the immune system, enhances detoxification, and supports good health. BrocColinate contains high amounts of the heavily studied and multi-patented ingredient sulforaphane glucosinolate†, found in broccoli and broccoli sprouts. Sulforaphane glucosinolate† offers powerful support for total body detoxification, improved immune system response and optimal joint health. Directions: One packet daily or as directed by your healthcare practitioner. Other Ingredients for Omega 600 USP™: Gelatin, glycerin, food glaze, enteric coating, mixed tocopherols, sodium alginate, acetylated monoglycerides, Polysorbate 80, sorbic acid. Other Ingredients for D3-5000™: Safflower oil, extra virgin olive oil, gelatin (bovine), glycerin, water. Other Ingredients for CurcuCalm®: HPMC (vegetable capsule), vegetable stearate. Other Ingredients for BrocColinate®: HPMC (vegetable capsule), stearic acid, vegetable stearate. Other Ingredients for L-Glutamine: HPMC (vegetable capsule), rice flour, vegetable stearate. Free of: Milk, eggs, shellfish, tree nuts, peanuts, wheat, soy. Warning: Contains Ashwagandha Root. Do not use if pregnant or lactating. †Sulforaphane Glucosinolate is produced under US patents: 5,725,895; 5,968,567; 6,177,122; 6,242,018; 7,303,770 and patents pending. Antioxidant-rich supplement that may enhance the immune system, help with detoxification, and support overall good health. A natural, soy-free, 5000 IU of bio-identical vitamin D supplement that supports overall bone health and the immune system. Support for the immune system, digestive system health, and nutrient and water absorption.